Theta and gamma frequency oscillations occur in the same brain regions and interact with each other, a process called cross-frequency coupling. Here, we review evidence for the following hypothesis: that the dual oscillations form a code for representing multiple items in an ordered way. This form of coding has been most clearly demonstrated in the hippocampus, where different spatial information is represented in different gamma subcycles of a theta cycle. Other experiments have tested the functional importance of oscillations and their coupling. These involve correlation of oscillatory properties with memory states, correlation with memory performance, and effects of disrupting oscillations on memory. Recent work suggests that this coding scheme coordinates communication between brain regions and is involved in sensory as well as memory processes. Multi-item messages must often be transmitted between brain regions. For instance, short-term memory may represent the last several events in the recent past; similarly, the sequence of events that constitute an episodic memory may be recalled from long-term memory. Handling such multi-item messages requires a neural code that specifies not only how items are represented, but also how different items are kept separate (e.g., the longer pauses that separate letters in the Morse code). 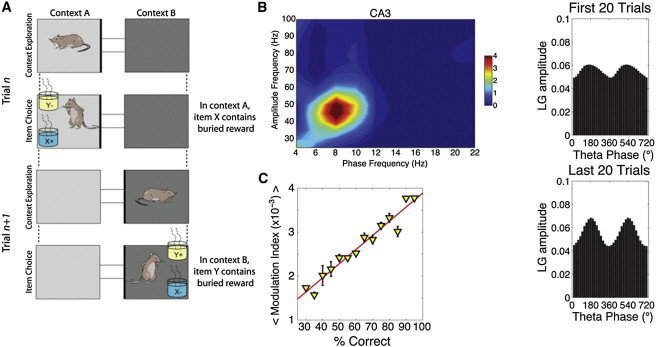 Here, we evaluate the hypothesis that the neural code for multi-item messages is organized by brain oscillations.